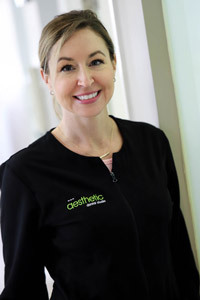 Leslie is thrilled to be a part of the Aesthetic Dental Studio team to provide dental hygiene services to help support and maintain your oral health. She was interested in dentistry from a young age and received her Diploma in Dental Hygiene with Great Distinction from SIAST in Regina, SK in 2007 and prior to that, a Certificate in Dental Assisting in 1998. Leslie looks forward to continue her life-long passion in all things dental by getting to grow and learn alongside this exquisite team, and to help our patients in a gentle and respectful manner.